It's time for a new feature on Sword Coast Junkie: a book review! I've read vast quantities of D&D-related printed media recently, so these columns will be the place where I gather my thoughts, summarize the plot elements and ultimately decide whether I recommend the book or not. Homeland is the first book about D&D superstar and posterboy Drizzt Do'Urden. Chronologically only, though, since he first appeared as a sidekick in The Crystal Shard, Salvatore's first book set in the Forgotten Realms. Apparently, the fans liked Drizzt more than the main character, so an origins story became the next project. 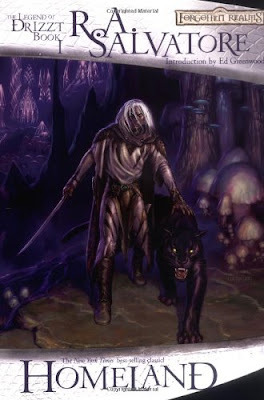 Drizzt is born into the Do'Urden house at the same time as the house defeats House DeVir and rises to ninth house of the dark elf capital Menzoberranzan. Drizzt's older brother falls during the battle, saving his life as noble houses only keep two sons. 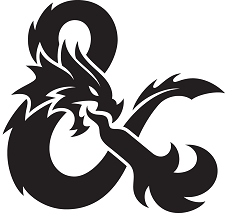 We follow him during his training and formative years, learning how and why he ultimately chooses to leave the hostile drow society for a life in the underdark. During these 30-or-so years, a revenge plot and a case of stolen identity slowly creeps forward, nicely illustrating the elves' longer lifespan. This is something that (understandably) never gets enough attention in fantasy roleplaying but lends itself well to the book format. Homeland never gets as complicated as some of the later books when it comes to drow names, plotlines and deities. As such, the book serves as an excellent entry point to the series and the character. It is also a somewhat brutal reminder that we do not choose our own family, but that it is up to every one of us to surround ourselves with the people that share our worldview and who understand the concept of “friends”.